Matzo Ball Soup Recipe - My Family's Favorite Soup! 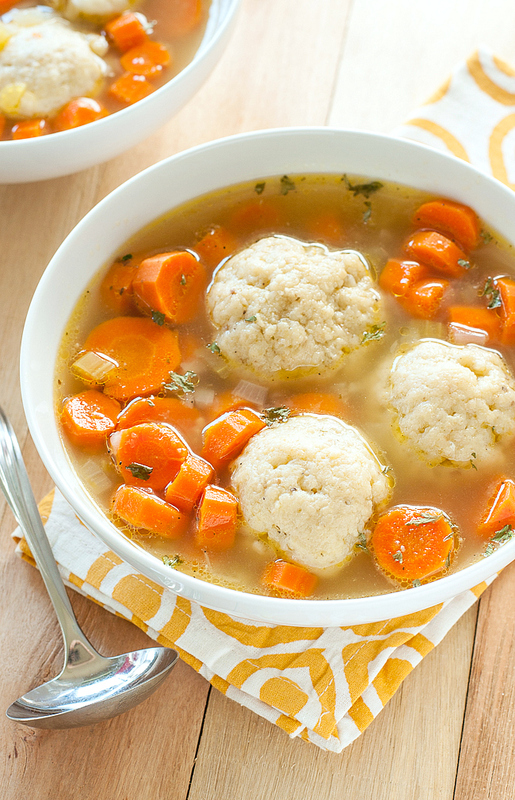 This vegetable packed matzo ball soup is a warm hug in a bowl and positively delicious! It’s my all-time favorite soup to slurp when I’m feeling under the weather and a must for sweater weather! It’s finally chilly enough to start indulging in anything and everything hot and steamy: coffee, tea, cider, chocolate, and BUCKETS of soup! I’m going to make you a promise that I will try my hardest to keep. I will come up with new recipes this Fall/Winter. Cross my heart. This also means, of course, that I will refrain from eating matzo ball soup everyday, non-stop, until salad weather is once again upon us. Last year I found myself positively unable to overdose on it and the number of times it graced my plate was a tad excessive. Feeling under the weather? Matzo ball soup! Husband deploying overseas? Matzo Ball Soup! Need to squeeze into your skinny jeans? Matzo ball soup! Locked yourself out of the house without pants on again? Um, you’re screwed. I know I’ve totally mentioned mazto ball soup a million and one time already in my What I Ate Wednesday posts, so once again I’m begging you, put these balls in your soup. Feel free to use homemade or store-bought low-sodium chicken broth and you can even add chicken to the soup if you’d like! Leftover roast chicken or rotisserie work like a charm! Use homemade or store-bought vegetable broth or dissolve Better Than Bouillon Vegetable Soup Base in filtered water to make a speedy, flavorful broth. Done deal! We love this broth bouillon! This is my family’s go-to recipe for matzo ball soup. Love it so! I’ve made it hundreds of times and it’s amazing each and every way, every single time. We probably make this once a month during colder months and I could probably eat it more often than that if given the opportunity! 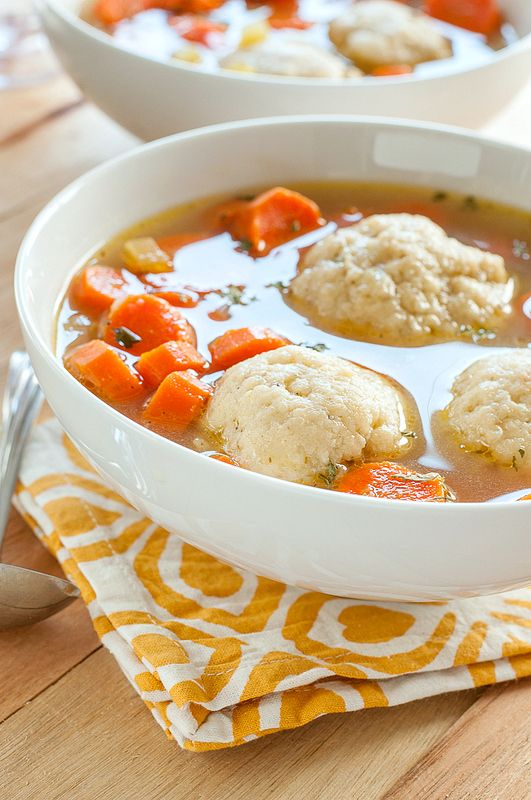 This vegetable packed matzo ball soup is a warm hug in a bowl and positively delicious! It's my all-time favorite soup to slurp when I'm feeling under the weather and a must for sweater weather! Chop, dice and mince your veggies. In a stockpot, drizzle approx. 1 tablespoon of olive oil over onions, carrots, and celery and stir. Add 1-2 cranks of freshly ground black pepper and a pinch of salt and saute on medium-high until veggies appear translucent, stirring occasionally. Towards the end add the garlic and sautee for an additional minute. Once your veggies are sauteed and translucent, add enough broth or water to barely cover the vegetables and simmer. 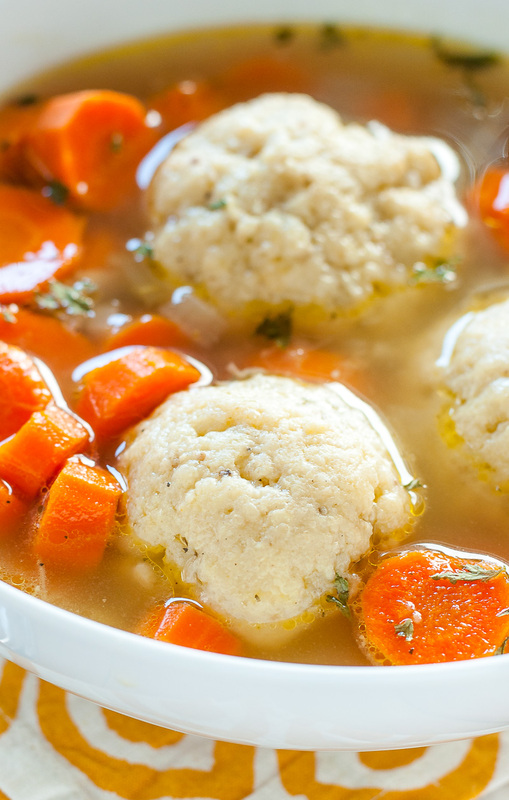 While the veggies are simmering away, make matzo balls. [click here for a photo tutorial of how to roll matzo balls!] Gently whisk 2 eggs with 2 tablespoons of olive oil in a small bowl. Add contents of the crushed matzo mix pouch to eggs and oil and mix thoroughly. Refrigerate for 15 minutes. While you wait, bring a medium sized pot of water (approx 2 quarts) to a boil. Add 1-2 TBSP of veggie bouillon to the boiling water to make a broth along with 1/2 the seasoning packet provided with the matzo ball mix. The strength of the broth is totally up to you. I usually add 1 TBSP and 1/2 the packet and then add a little more later. Remove your bowl-o-matzo from the fridge and roll into approx 10 balls with a slightly larger diameter than a quarter. Don't squeeze or pack them tightly, just lightly roll them into little lumps. Gently add your balls balls into the boiling water, cover, and reduce to low. Set your timer and simmer for 20 minutes. Once your balls are ready [pshh they were born ready!] gently spoon them into the stockpot with your veggies, then add the liquid too. Now you have all your balls in one place =) Now you get to season! Start with a crank of freshly ground black pepper and a pinch of kosher salt. Then a sprinkle or two of parsley and 1/4 tsp or so garlic powder. Next add a small pinch of thyme and oregano or 1/4 tsp or so of your Italian seasoning blend. Taste as you go, and adjust as needed. You can immediately dig in or wait for the soup to simmer and blend a little longer. I usually help myself to a small bowl right away as a test-run, then another when it's time to sit down for dinner. As the soup simmers away, the flavors continue to develop further and intensify to matzo ball soup perfection. It's positively fabulous the next day too! I seriously can’t get through a cold without this stuff! Matzo ball soup and chicken soup are essentially Jewish penicillin. They cure all ailments and make everything better! Matzo balls to the rescue! Swoon. Eat. Repeat. This soup rocks my socks! In fact, I’m slurping a bowl while I type! If you get a chance to try this homemade matzo ball soup, let me know! 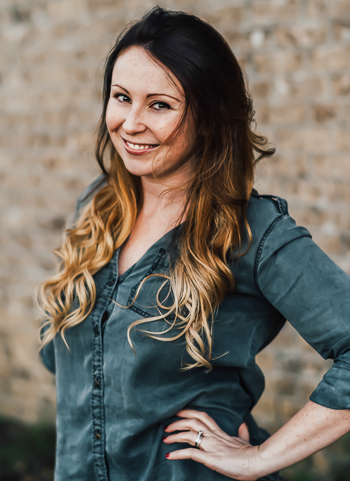 You can leave me a comment here (LOVE checking those daily!) or tag @PEASandCRAYONS on Instagram so I can happy dance over your creations. I can’t wait to see what you whip up! How could you forget to add to always make sure the balls are fluffy, nobody like hard balls in their soup. I love this recipe, pretty sure I had it every time I was sick junior year of college. LOL! I’ll make you a big bowl next time we visit! Miss you! Hi! Just wondering if I can make this in advance and freeze it? I am supposed to make a big batch. How many servings does one batch make? Hi Rachel! The recipe yields 4 bowls. I always mean to freeze some for later to see if the matzo balls can hold up to freezing and we always bail on the intended experiment b/c we want the leftovers so bad the next morning. While the broth and veggies freeze well, I’m not sure if the balls will hold up to freezing. Super comforting and hearty soup! One of the most flavorful broths I’ve ever sipped on. YAY! Thank you Kristin! I seriously cannot stop making this soup right now – it’s my fav! Don’t eat eggs. What should I substitute to hold balls together? I made this last night because I wasn’t feeling well at work and this sounded good. Best decision ever. The only changes made were that I used regular chicken stock instead of a veggie bouillon, and I used roughly a quarter of the soup packet. This is going to become a regular recipe for me! Just made the soup!!! Amazing!!! I can’t believe I waited so long to try it. Thanks. Oh lord do i love Matzo Ball soup. My old roommate was jewish and we had it all the time. I haven’t had any since we moved away though 🙁 Time to change that!! Thanks for posting! also, I may have read that last line as “always put balls in your mouth” Does that say anything about where my mind was? Is it also probably inappropriate that I wrote that sentence on the interblag? Most likely is the answer to both those questions. Woops! Can’t wait to give it a try and I CAN’T WAIT FOR WIAW TOMORROW! this soup looks perfect for this cold weather! This soup looks gooooood. I love that you’ve served it in mugs as well. I wonder if we can get this matzo stuff in the UK…. Soup and Balls? That’s what I’m talking about! Will more balls be accompanying these new soups? That would be fabulous if they did. HAHA! Seriously, can’t wait to try it. Matzo ball soup is one of my most favorite things ever! I am thinking it will be a fun filled couples activity to make the matzo balls. The soup looks great! I cannot wait to try this one. I pinned it and added the Matzo Ball soup mix to the grocery list. I’m very glad you repeated it. Anything dealing with balls is fair game for a rerun. Like Amber, I’ve never had matzo ball soup, either. But I’ve always wanted to try it! And if you’ve made this recipe a million times, then obviously it’s a winner. I love knowing which recipes people make over and over again, because those are the ones that you KNOW are good! Chicken stock. Schmaltz. Then we have a deal. Is there such a thing as whole wheat matzo mix? 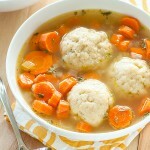 LOVE matzo ball soup and will definitely be putting some balls in my soup this weekend! 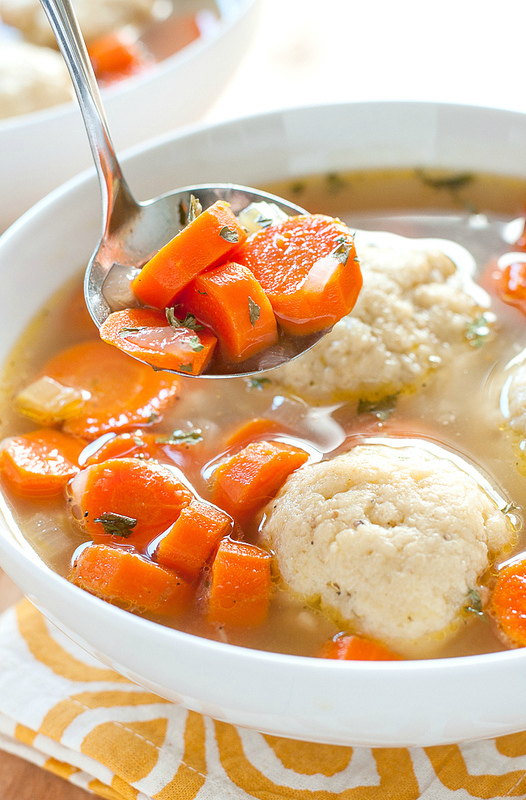 LOVE matzo ball soup _ now I have to make some this weekend!